Application Instructions For Installing the vinyl car stickers...It's EASY!!! How to install vehicle graphics or any large graphic using the wet method. 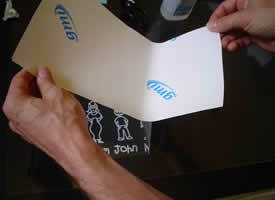 Upon recieving your decal in the mail - unroll and layout flat. Lightly squeegee out any wrinkles caused by the shipping process. sunlight, apply in the shade. Do not apply if the tempurature outside is below 50 degrees. Also, trying the sample decal first will help if your unsure. again or squeegee more then try again patiently. will go away on their own. Wrinkles can usually be massaged away with a heat gun. guarantee as to how long they will actually last. Also see the F.A.Q. for more. 1. It's very important to clean window or surface with rubbing alcohol and apply in the shade. DO NOT apply in the sun or to hot glass. Do not apply if the tempurature outside is below 50 degrees. Also, trying the sample decal first will help if your unsure. 2. 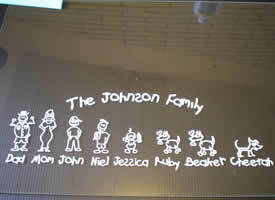 Tape decal to window like the picture below. Use 3 pieces of tape. application paper revealing the sticky side, but not past the middle 2 pieces of tape. decal from the center out as well. their own. Wrinkles can usually be massaged away with a heat gun. long they will actually last. Pictures for the Exact Positioning Method....It's Easy! 1. Gather simple supplies. For this method you'll need tape, rubbing alcohol, scizzors, napkins, and a squeeqee or credit card. Clean the surface well with rubbing alcohol. 2. 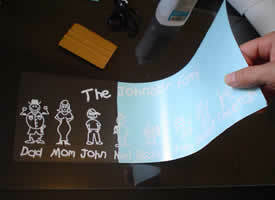 Tape Decal to surface as shown using three pieces of tape as shown. Masking tape works well. Make sure you tape it excactly where you want it because that's where it will end up. 3. 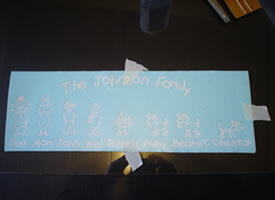 Peel back side without tape and cut wax paper underneath. You might want a friend to help hold the stick part so it don't fall back on the glass. 4. 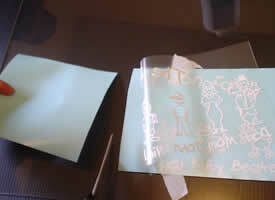 With the wax paper cut off on one side, get ready to apply half of the decal. Preferably using a squeegee or credit card applying from the center outwards to reduce air bubbles. 5. Apply the one side from center outwards. 6. Remove the three pieces of tape now. Lift the other side. 7. Peel off wax paper backing from where you cut with the scizzors and hold the rest of the decal up and get ready to apply like you did the other side. 8. Squeegee the other side on as you did the first side. From the center out to reduce air bubbles. 9. 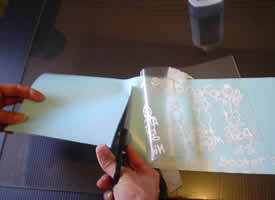 Once the whole decal is applied, very slowly remove the top layer of application tape at a sharp angle from the sticker. 10 . Da Da!! Don't That Look Great!